Although we hope that you are 100% satisfied with everything you purchase at Diaper Lab, we understand that sometimes an item will need to be returned or exchanged. Except as noted otherwise, Diaper Lab accepts the return or exchange of unused, unwashed, and unworn items, still new with tags, for a refund of purchase price within 14 days of original sale, or within 90 days for store credit. Clearance items or items that come from our gently used and buy back section are final sale at time of purchase and not accepted for return or exchange. In the event of a defect in quality or workmanship, please contact us for assistance. Be certain to follow vendor care recommendations as workmanship issues will not be considered for items that have received improper care. Come by during our regular business hours with the item and receipt, and we'd be happy to take a look at it with you to resolve the issue. Please include a copy of your receipt, and a note with your name, phone number or email, date of purchase, and description of issue, as well as desired solution. If an exchange is requested, please detail the item you would like instead. If it is easier, please feel free to email or call us with this information and give us a heads up to expect your item. We are not responsible for misdirected mail or lost packages. As a service for our customers, we provide a limited amount of Buy Back of gently used diapers for store credit only. Diapers that can be used by another baby, but not in good enough shape for us to resell as Gently Used can be donated to our Cloth Diaper Bank. Please take a look at our Buy Back Guidelines before bringing your diapers for assessment. We have a small shared parking lot in which there are three spaces reserved for Diaper Lab customers. In our lot, please respect our neighbors and park only in the spaces that are specifically sign-posted for Diaper Lab. There is also metered parking on the street near our building, and in Davis Square, where there are several municipal parking lots. For Cambridge and Somerville residents with parking stickers, there is often parking nearby on side streets (west of Elm Street south of Russell street is primarily Cambridge, and east is Somerville, but please check the signs). Note, too, that metered parking on the street or in lots is free on Sundays. 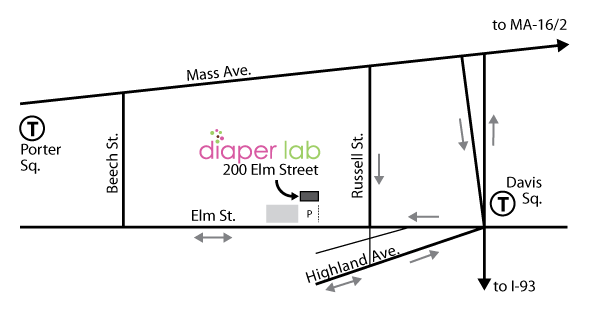 Diaper Lab is located in Cambridge, Massachusetss, between Davis and Porter Square, at 200 Elm Street. Our building is at the back of the parking lot next to Harvard Square Eye Care and Mem Tea. We are an easy walk from both the Porter and Davis Square Red Line T stations, and are also on the 87 and 96 bus routes. We also have a limited about of free parking, with other meter and lot parking nearby. If you are travelling by car and using GPS, use 201 Elm Street, Somerville, MA 02144 (and we are across the street). There is another Elm street in Cambridge near Inman Square, so please double check that the directions are leading you to Elm Street between Davis and Porter Square! You can see our regular business hours here. Please note that any special or holiday hours will be noted on our homepage instead.